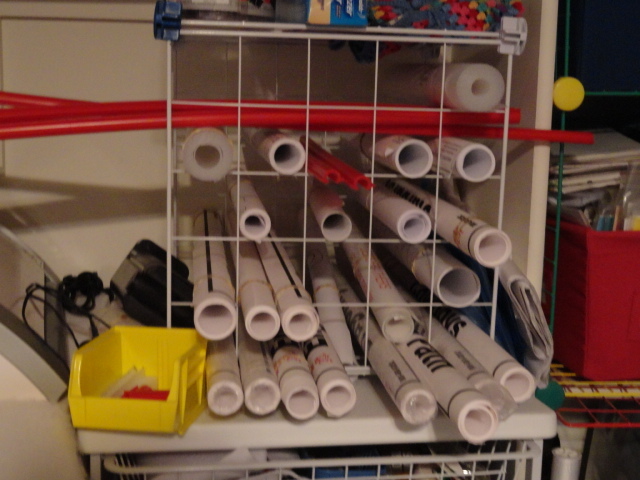 Anyone have any clever ideas on how to store/organize pantograph patterns? rolled, upright in a large basket, with name on painters tape or top outer edge. I put my small ones in a wire trash basket. The big ones go in a wire cube. I had these left over from a set I use under my quilting machine. I also have a behind the door shoe holder for little ones. I am going to get rid of most of those as I do many of those free hand now. 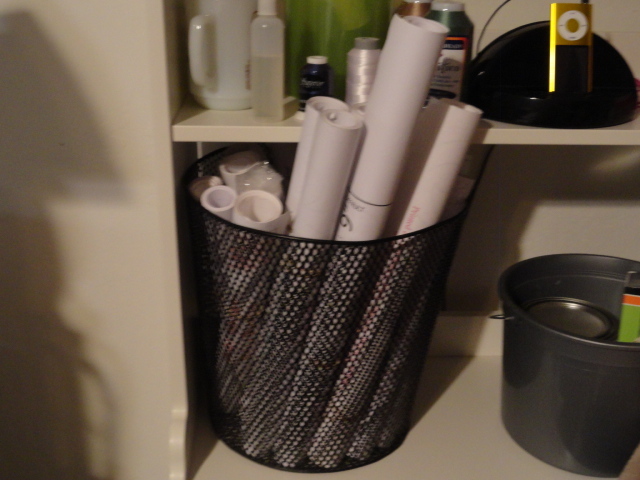 Keep a look out for the Christmas wrapping paper storage bins after Christmas. How about the narrow plastic bins that are for rolling under your bed at Walmart? How about standing them up in the plastic pop crates. I use Pizza boxes from our local pizza place. They are useful for quilt blocks (large boxes) as well as other things. I have about 15 of them and they stack nicely. Hope this idea helped! I only have a handful so they get stored in my antique steamer trunk (that still has the insert) with my thread. I have a plastic Sterlite 3 drawer organizer from Walmart with the wide drawers so all sizes fit into the drawers. It works perfect.